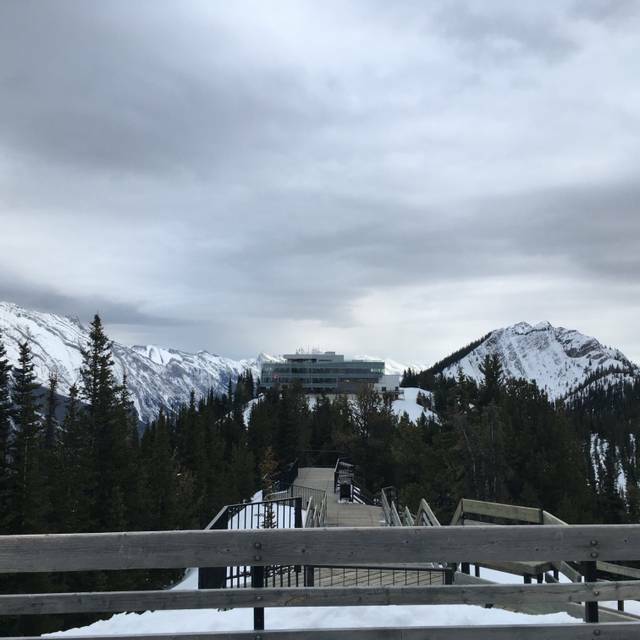 DINE ABOVE BANFF Anchored at over 2,200 meters above sea level, the Banff Gondola’s Sky Bistro sits on the summit of Sulphur Mountain. 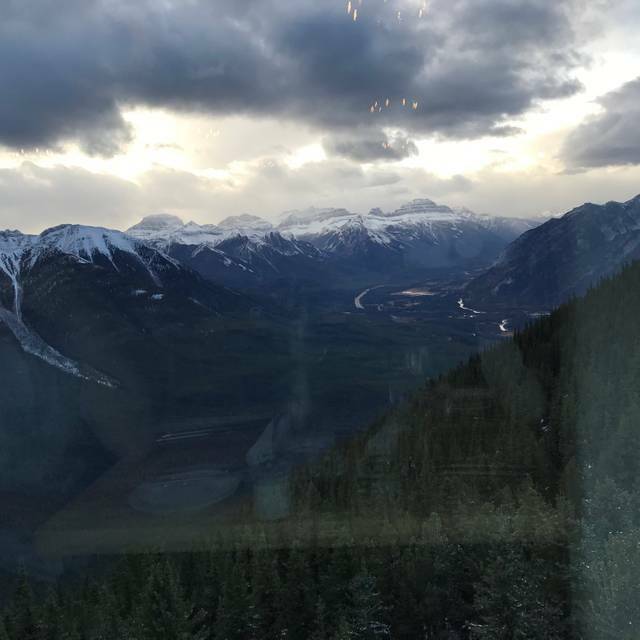 With six Rocky Mountain ranges as a backdrop, this remarkable restaurant promises an exhilarating gondola ride followed by a mountain top dining experience. Lunch and dinner menus celebrate the panorama of Canadian cuisine, with ingredients drawn from both ocean coasts, plus wholesome prairie staples including world-renowned Alberta beef. 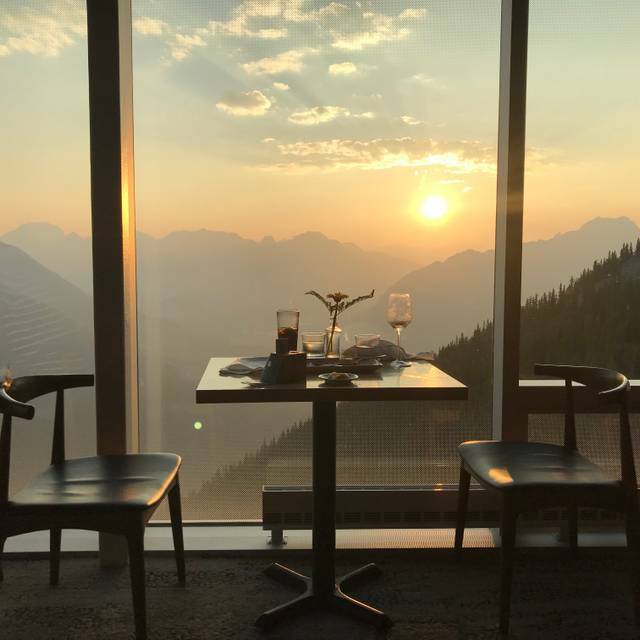 Complemented by local wine, beer and spirits, it makes for a unique dining experience above Banff. ***please note all seating requests at Sky Bistro are on a first come, first serve basis. The combo ticket for dinner and gondola experience is a great value. How they manage to offer gourmet dining on a mountain summit only accessible by gondola is a wonder. 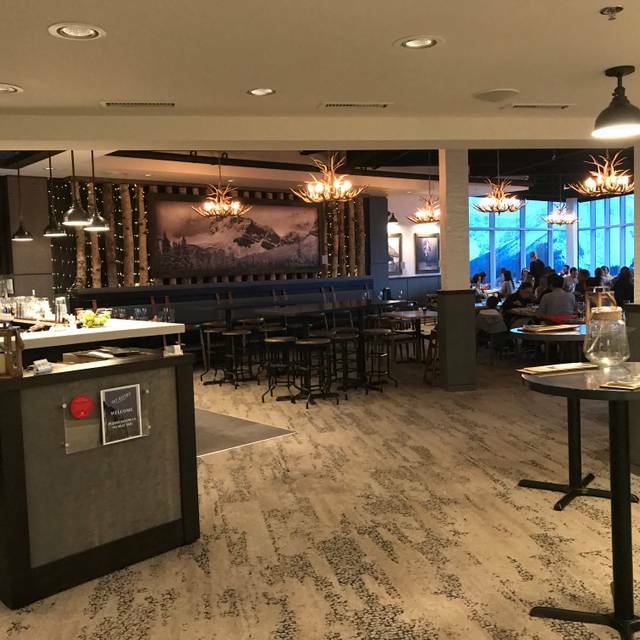 Make your dining reservation through Open Table then go to the gondola station and add it to the experience package. Go a couple of hours before your reservation to enjoy all the features at the summit. The service, atmosphere and food are amazing! This was my first trip - a girl’s weekend - and the bistro was definitely a highlight. Amber took great care of us, and spoke to the chef to accommodate a dietary need. An aside, we did feel the salmon was cooked a little under what were used to but it was delicious nonetheless. Highly recommend! We had such a wonderful time at Sky Bistro. From the moment we checked in at the Gondola base to the minute we left we were greeted warmly by every person we encountered! We loved the idea of a window seat but none were available at our reservation time. We still enjoyed a nice view regardless but when we ordered dessert, our server Eric informed us that a window seat had become available and offered to move us over! What a nice gesture. Kristin the manager came by a few times to check in on our dining experience and we couldnt have been more grateful that everyone cared so much. Eric our sever also asked if we were local and when we informed we were, he got us the locals wine list that had some discounted wines available. We gladly ordered a wine off the list which was delicious and paired well with our food choices. The food was incredible! Bison tartare, halibut cheeks, lamb and short rib! We cleaned our plates! We will be back for sure! Thanks for a truly memorable experience. With a lot of panoramic pictures. Wow effect at 360 degrees. Love it . The lamb will keep me coming back. Great idea to have a locals' special with free gondola service!!! I'll come for that for sure!! The dining room is beautiful. Wonderful views from all tables. However our meal didn’t meet our expectations. Weirdly we received our 2 ordered appetizers plated on 2 plates as if we asked to have them split, which we didn’t, we love to share. The bison tartare was then plated with both plates having their own egg yolk which for the portion size (being split) was way too much yolk. Brussel sprout salad (again was split) plated in 2 tiny soup cups, again weird. Found the dressing to lack flavour & the beet on bottom a little out of place. For our mains we ordered the lamb which was so over cooked, flavour was good, close to being too salty but recieved well done instead of medium rare. The gnocchi was heavy on the blue cheese & the gnocchi dumplings themselves were undercooked & kind of gummy. We were never offered a dessert menu after our mains were cleared, only received the bill. We were aware of the last gondola being 8:30pm this time of year but it was only 7:50pm so there was still plenty of time for us to finish with a dessert or coffee. We did really enjoy ourselves, the view is spectacular & we realize writing a review like this is somewhat silly, it’s better to have said something while we were dining. We tend not to complain about anything when we dine out & just go with whatever the flow may be. Thought maybe this would be more of a constructive review. Hope it helps for future diners. The restaurant is amazing, the music enjoyable. The food was perfectly cooked and really tasteful. Our waitress was Claudia, so kind and perfect in attendance. The gondola ride plus 2 course dinner for 89 CAD per person was an outstanding value. They have separate dinner menu to accommodate kids as well. The food and the views from the restaurant were spectacular! We had early dinner starting at 4.30pm and finishing at 6.30pm. Their bison tartare starter was rendered perfectly. Their trio of pork in pork fat roux was excellent. All ingredients were local and fresh. Their wine selection from all over Canada is pretty decent as well. Desserts were lovely too. After dinner we explored the different levels of the building in which the restaurant is located. It has a mini museum and a mini theater that shows 5 minute shows on Banff history. The rooftop is not to be missed as it is set up for dining as well amidst spectacular mountain scenery. Finally, we went on the Sulfur Mountain boardwalk all the way to the top to enjoy the vistas as the sun set over the Canadian Rockies from our vantage point at 7500 feet. All in all, a memorable evening indeed! A very delicious meal with a great view. Unless you are hungry, the meal/entree coupon will have you bringing food home, big portions. Many drink options and service is very personable, friendly and attentive. Outstanding view makes it a must experience. Good service, very good food, decent portion size, little bit pricy but well well worth the view you have while dinning! Unbelievable atmosphere, fantastic views, and stellar service. No, but really. BEST night of my life. Fantastic setting for our anniversary. We booked on Monday of our arrival via the Open Table app as recommended by a Banff Gondola staff member (THANK YOU!!!). Caught the gondola up on Friday for a 6:30 p.m. reservation. Was greeted by Tristan (Mgr) and Jamie? (hostess) immediately and they took our coats. Our table wasn't quite yet ready, so they sat us near the open bar area and served us some chilled local(ish) champagne while we waited for the table to clear. We had made a note that it was our anniversary. Both mentioned it and treated us to the champagne on the house due to the special occasion and the short wait. Very kind. Our meal was outstanding. My wife had the tartar app, I had the duck wings. Both ample and delicious. For our entrees, I had the beef short rib and my wife had the lamb rack. Again, both delicious. I also enjoyed a Sundance cocktail (two, actually) while we watched the sunset and took in the magnificent sunset and scenery. Our server was named Eric and he was fantastic. Very knowledgeable, kind, suggestive, and attentive. For an attraction restaurant, we were not sure what we would get as far as food, beverage, and service quality. But, the Sky Bistro, by far, exceeded our expectations. Talking w/ Tristan after our meal (as he was checking in on us, as a good manager should and does), it was obvious that he and the head chef (Scott?, maybe) had put time, effort, and attention to detail into making the Sky Bistro more than just a destination/attraction restaurant and more of a higher end, fine dining experience. On our way out, several other servers wished us Happy Anniversary as well. We bought the dinner/gondola combo pack and I found it to be a very solid value. The drinks cost extra obviously. Between the app and entree each, we were satisfied and full. So, we bypassed the dessert menu and just sipped on our drinks and enjoyed the alpine glow sunset and scenery. Over all, very, very pleased. Job well done, Tristan and Sky Bistro staff. The entire Sky Bistro experience surpassed all of our expectations. This was an amazing experience and breath taking dinner for a great price. My only regret is that we did not go up even earlier to take in even more of the amazing views! The toasted s’mores on the roof top were a great and tasty way to end the evening. Amazing. Best service & food ever! 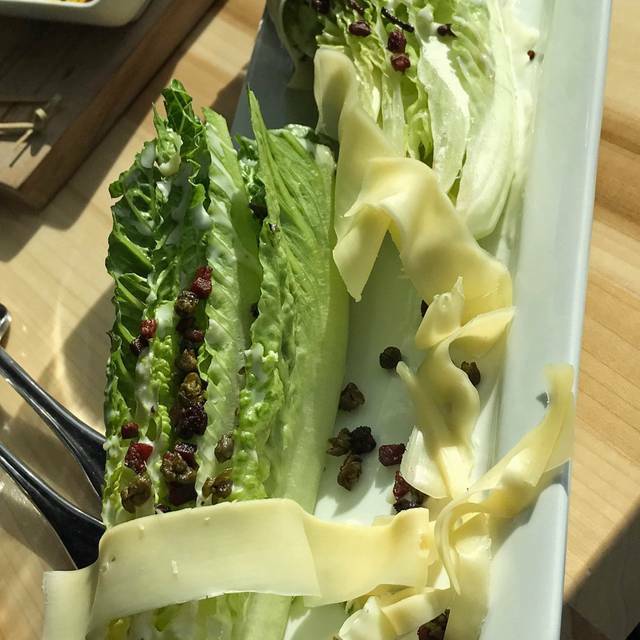 We hiked the mountain, saved on the gondola, so we could splurge on the food and service. Something even more rewarding about hiking the mountain to have the best experience ever! Will come again, just for the food. It's one of the highest quality restaurant around the world I've enjoyed. And there are many criteria for it, including friendly and professional service. To the million buck view and environment. It can't be cheap if you want quality and Five Star location. And this is cheap compare to some restaurants in top cities such as Hong Kong,Tokyo, Monaco,Venice, London .. Etc. Great experience with such a fine view and meal! Over from England and would certainly recommend it! 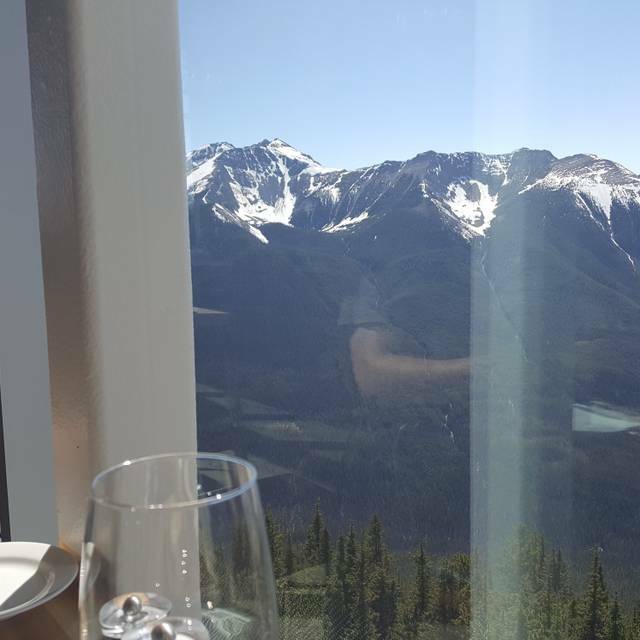 The hostess seated us the floor to ceiling window and the Mountain View was so stunning I broke into tears. The service and the food complemented this truly outstanding, moving never to be forgotten experience. Go there and do this!! Excellent food at reasonable prices in modern well appointed venue with stunning view, definitely recommend. This place has nice view of the mountains and neat atmosphere. But the food was not that great for the price you pay. The drink menu is very limited if you don’t want to have alcoholic drinks. Our server couldn’t give us any suggestions for nonalcoholic drinks so we ordered iced tea. However the iced tea was super diluted with over half glass of ice.The service was fair only. We asked our server to take a photo for us when the outside was still bright while she completely forgot about it and we missed the good timing for photos. Everything was good except 5of us had to sit at a table for 4. It was a great evening, and our server was very accommodating and fun. We loved it, and will be back and have told all our friends and family! The best views of the mountains! 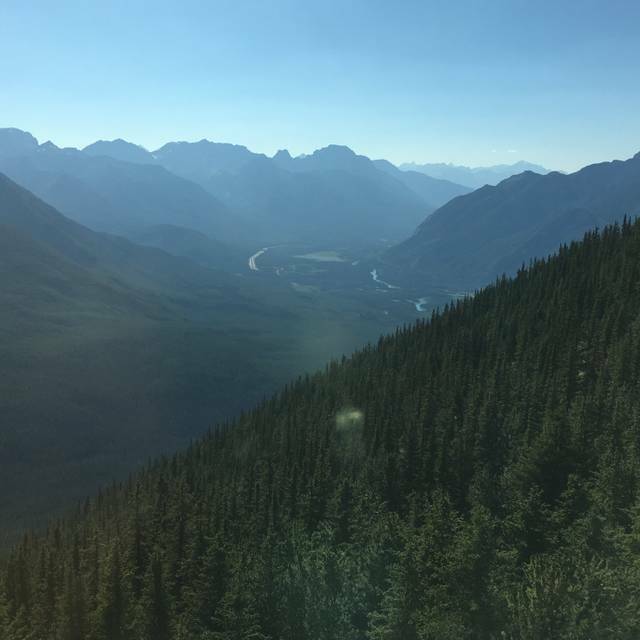 Our experience was truly wonderful, I loved the ambiance of the room, the view of the mountains was a special treat that made the experience an exceptional one. The ceaser drink I ordered was the best I've ever tasted! The general consensus of the meals was that they were ok but the portion size was disappointing. However the chicken and broccoli that one of us ordered was amazing! It's too bad the gondola ride up was so pricey, this will definitely be a deterrent to more visits in the future. This is definitely a great choice for a memorable dining experience though, and would recommend it for special occasions and celebrations! 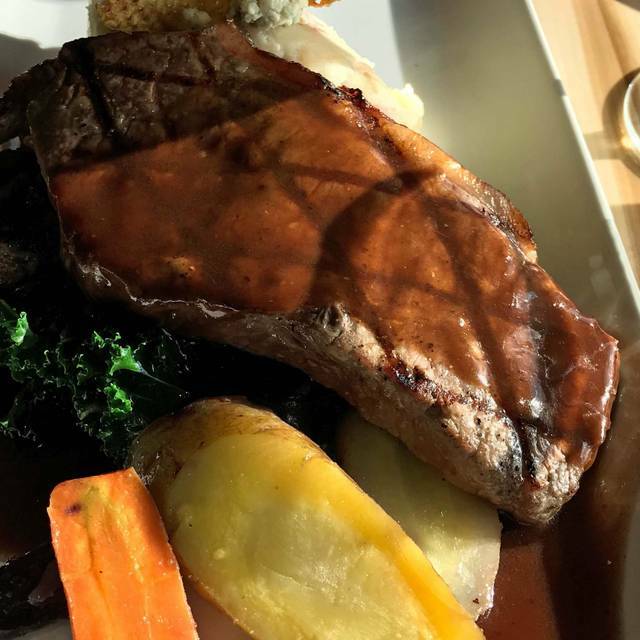 Great food combined with stunning views - who could ask for more? A holiday highlight. Very good food, make sure you get up top well before your reservation. Take in the views outside before you settle down in the restaurant. 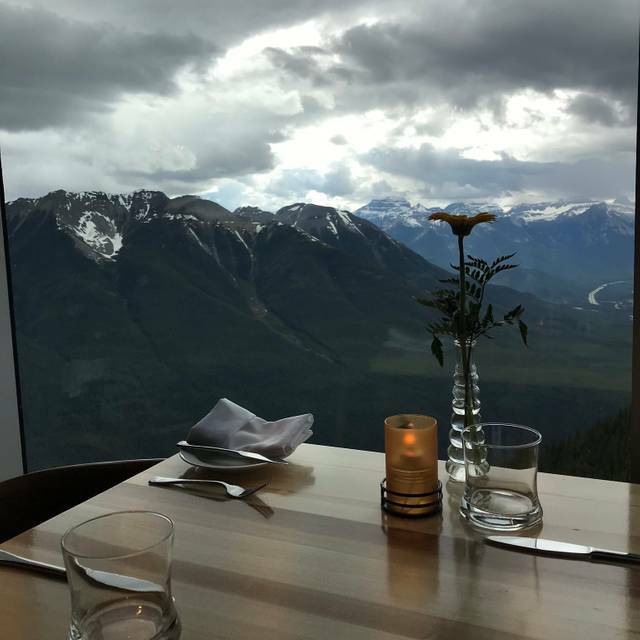 The views, food and service at Sky Bistro were unmatched. Very happy we added dinner here to our honeymoon itinerary. A beautiful experience, even on a cloudy day! Absolutely amazing dining experience on the top of the mountain! Amazing evening at Sky Bistro. I feel like most restaurant at places like this are a tourist trap with overpriced and ok food but everything was amazing. The food was great. Everyone loved everything they had. The service was great. And even the price was good for what you got. I was very pleased and would certainly return again. We went in the winter so by the time we at 6 it was dark but we went up the gondola early to enjoy the views. This place is definitely worth it. Great view and food. Service was meh. Great menu, food, setting, service. We a dinner there on Christmas eve.....what an experience!! Such a unique and beautiful setting ! The staff are incredible and the food is done to perfection! I had a delicious rack of lamb and my partner had a flavorful bowl of gnocchi.... the chef even came by our table to see how everything was.. class!! Great experience! Ride up on the Gondola and terrific food. 50% off a bottle of wine for locals night made it extra special. Seated on time and excellent service. Will certainly go again! This was a great dining experience! We went up on locals night and it was definitely worth it. From the great service and complementary dessert for our anniversary, to half priced bottles of wine, we thoroughly enjoyed dining in. We had a reservation for 5:30, which was perfect for December, allowing us time to take a peak outside while it was still daylight and walk around the exhibits before going to dinner. A great experience and I’m thankful for this locals night opportunity that I wouldn’t have normally experienced.